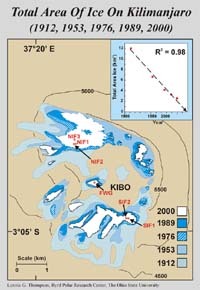 COLUMBUS, Ohio – A detailed analysis of six cores retrieved from the rapidly shrinking ice fields atop Tanzania’s Mount Kilimanjaro shows that those tropical glaciers began forming about 11,700 years ago. The cores also yielded remarkable evidence of three catastrophic droughts that plagued the tropics 8,300, 5,200 and 4,000 years ago. Lastly, the analysis also supports Ohio State University researchers’ prediction that these unique bodies of ice will disappear in the next two decades, the victims of global warming. These findings were published today in the journal Science. Thompson and his colleagues retrieved six cores from the mountain two years ago after his team spent more than a month camped at a drill site above 19,300 feet. After a logistical nightmare requiring the hiring of 92 porters and obtaining 25 official permits, the team returned 215 meters (705 feet) of frozen ice core to the freezers at the university’s Byrd Polar Research Center. One key to dating the core came with the finding of a chemical marker in the ice -- a spike of the isotope chlorine-36, a radioactive remnant of nuclear bomb testing in 1951-52. The same spike appears in cores the team had retrieved from both South America and China, allowing them to calibrate the historic records trapped in the ice. Clues from the cores suggest a much different, far wetter landscape near Kilimanjaro 9,500 years ago than is there today. Thompson said that at that time, Lake Chad, now the fourth-largest body of water on the African continent and measuring about 17,000 square kilometers today, covered some 350,000 square kilometers – an area larger than the Caspian Sea. The analysis of the core showed a 500-year period beginning around 8,300 years ago when methane levels in the ice dropped dramatically. “We believe that this represents a time when the lakes of Africa were drying up,” Thompson said, adding that the methane levels would register the extent of the wetlands thriving in the tropics. The cores showed an abrupt depletion in oxygen-18 isotopes that researchers believe signals a second drought event occurring around 5,200 years ago. This coincides with the period when anthropologists believe people in the region began to come together to form cities and social structures. Prior to this, the population of mainly hunters and gatherers had been more scattered. The third marker is a visible dust layer in the ice cores dating back to about 4,000 years ago. Thompson believes this marks a severe 300-year drought which struck the region. Historical records show that a massive drought rocked the Egyptian empire at the time and threatened the rule of the Pharaohs. Until this time, Thompson said, people had been able to survive in areas that are now just barren Sahara Desert. Last year Thompson initially predicted in a presentation at the American Association for the Advancement of Science last year that Kilimanjaro’s ice fields would vanish within 15 years. More recent evidence is reinforcing this prediction. By using global positioning satellites, aerial maps and an array of stakes placed on the ice cap, the researchers were able to confirm that the volume of the glacier is shrinking as well. Along with Thompson, other members of the research team include Ellen Mosley Thompson, professor of geography, Victor Zagorodnov, Henry Brecher, Mary Davis, Keith Henderson, Ping-Nan Lin, Tracy Mashiotta, Vladamir Mikhalenko, Douglas Hardy and Jurg Beer. The project was supported in part by a grant from the Earth System History Program of the National Science Foundation.